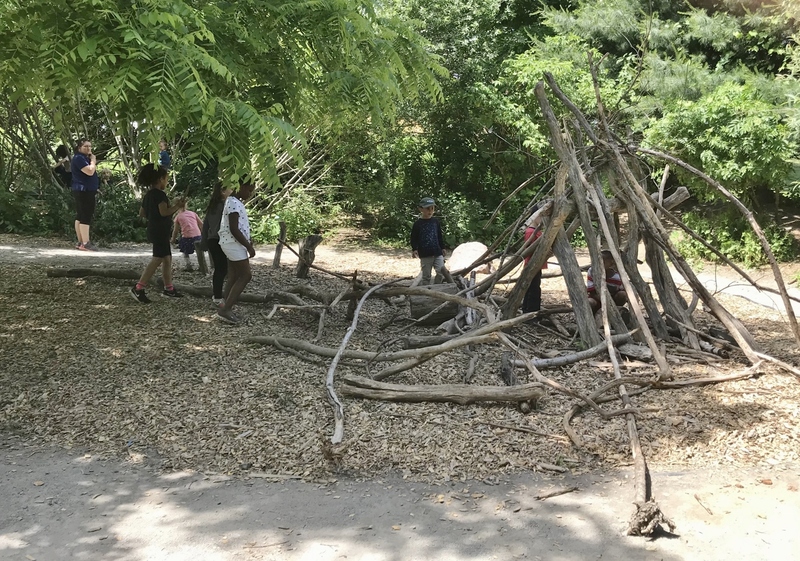 Kids from impoverished sections of my city don’t often get to play in natural settings, since they typically live in apartment houses and buildings with little to no yard space. 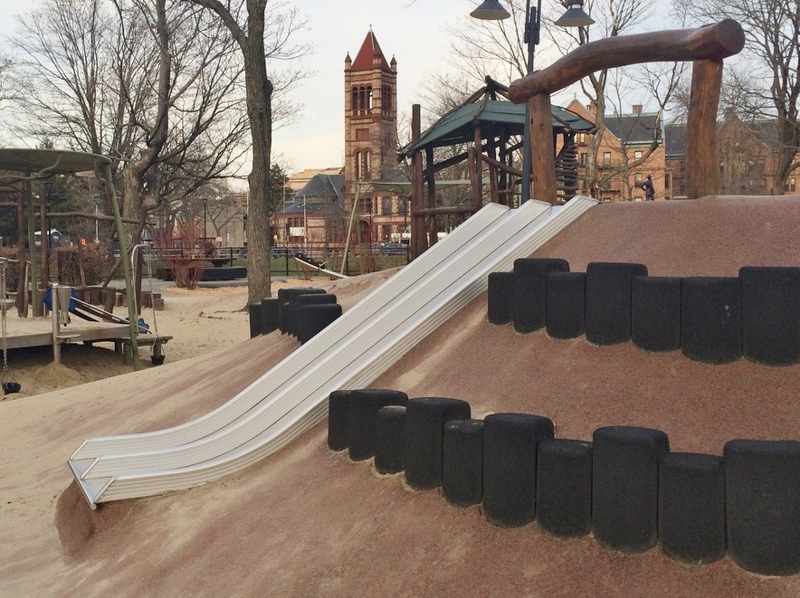 That has recently changed for some lucky preschoolers at the Webster Square Day Care Center here in Worcester, Massachusetts. 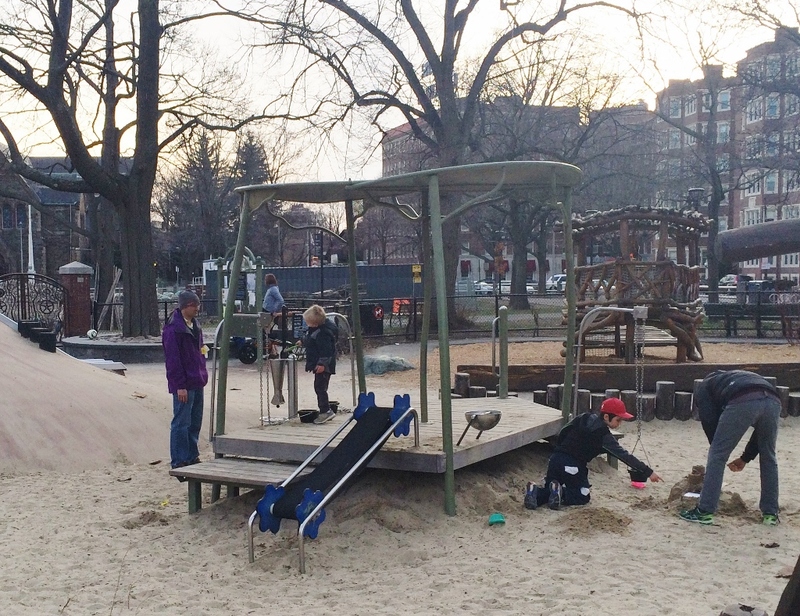 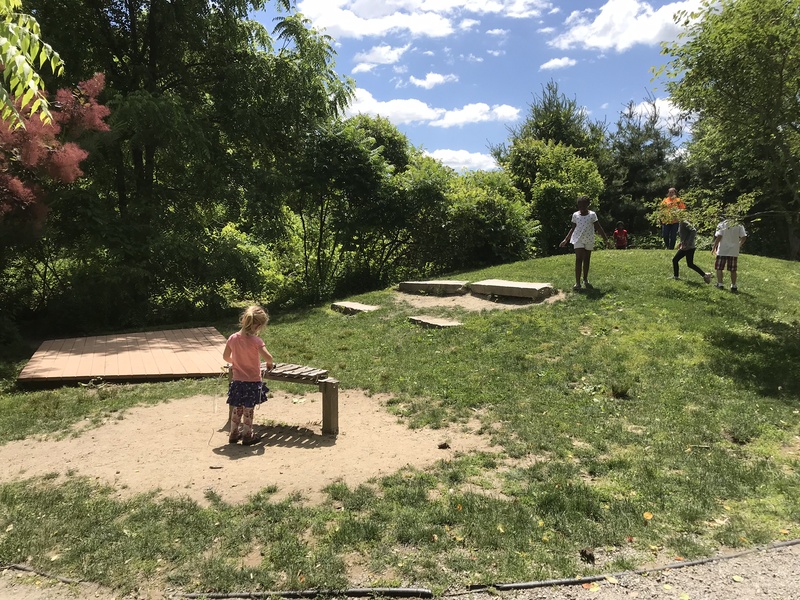 The center, which operates out of the lower level of a church, wanted to update their playground, which then consisted of scattered equipment within a sand surface. 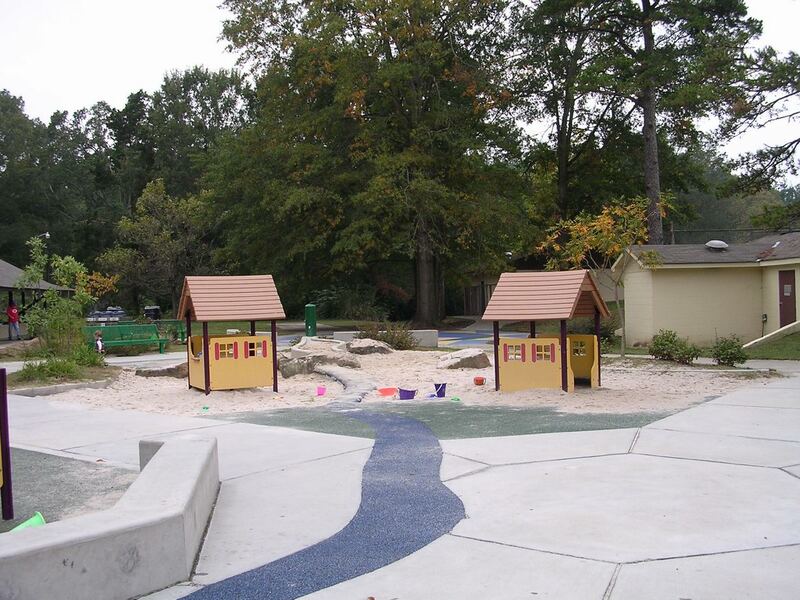 Originally their goal was to simply change the surfacing to a safer material that would be acceptable under current state requirements for day care centers. 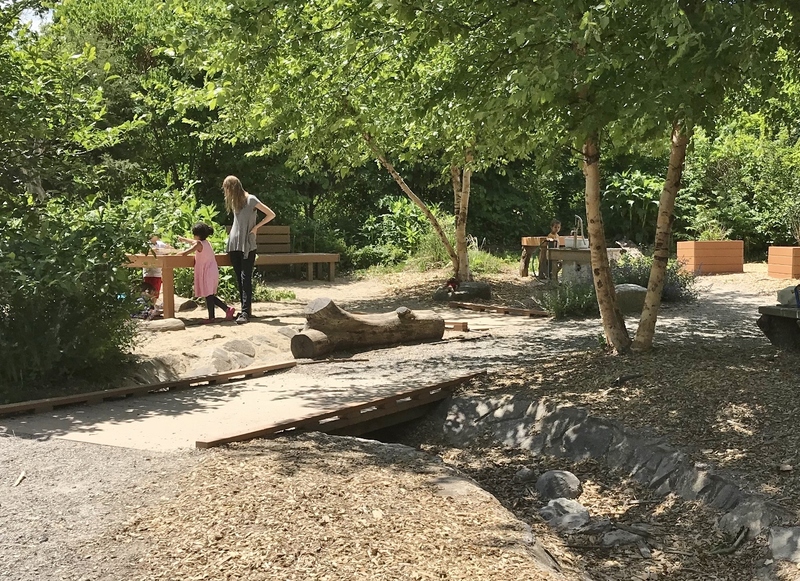 However, I convinced them to take the renovation a step further and add some nature-based features for a more enriching play experience. 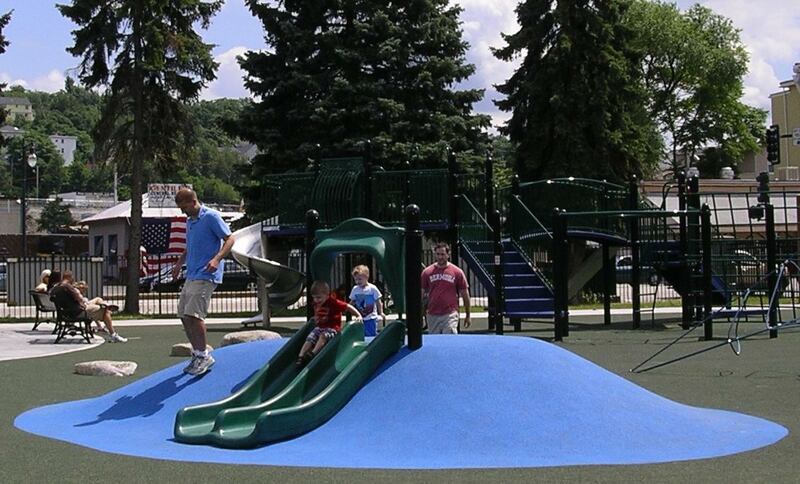 My firm developed plans for this playground, and the day care center received several grants which funded the improvements over a period of a couple years. 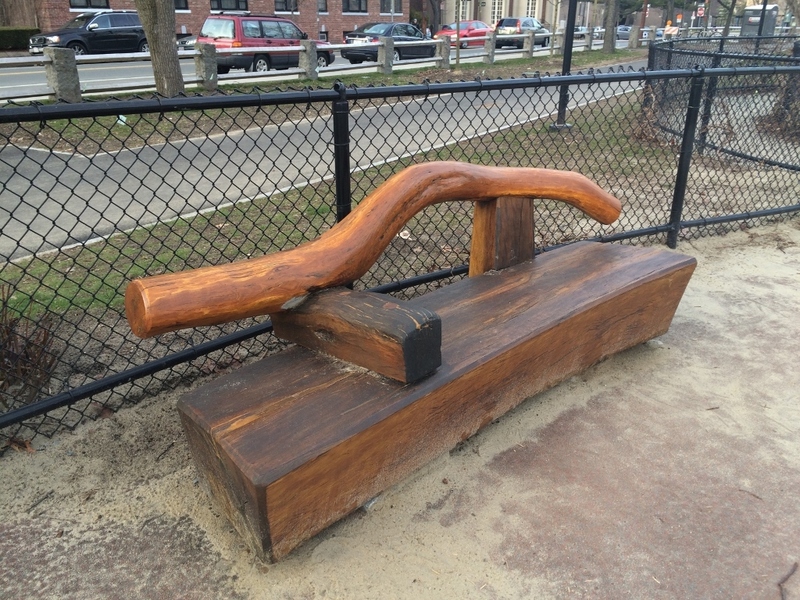 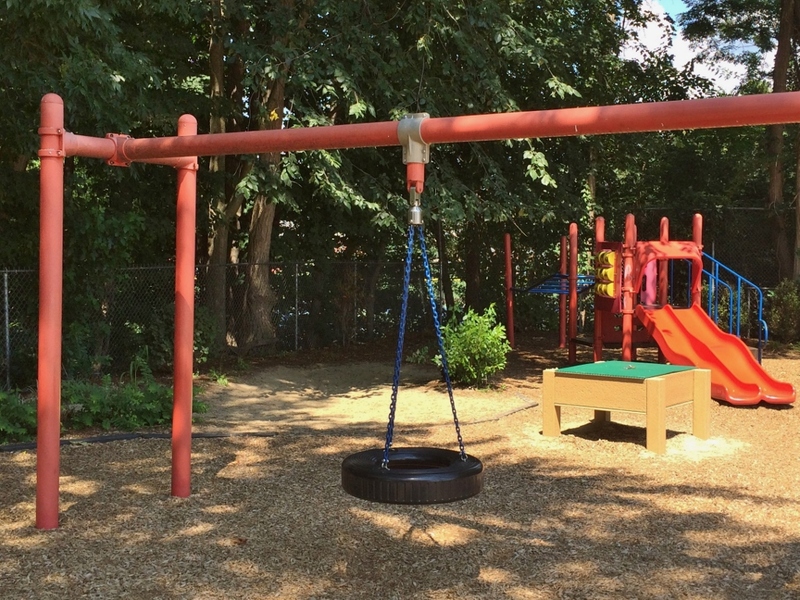 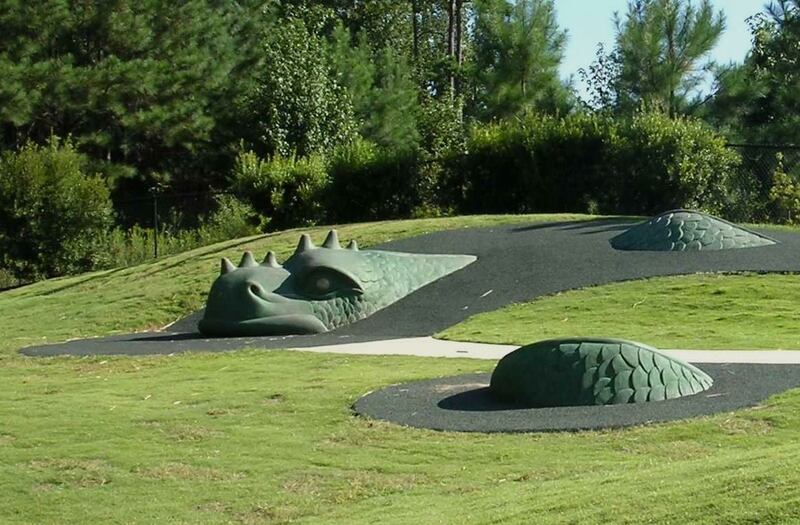 Since the budget was fairly limited, we retained the existing play equipment, keeping the larger pieces in their pre-existing locations and moving the smaller items. 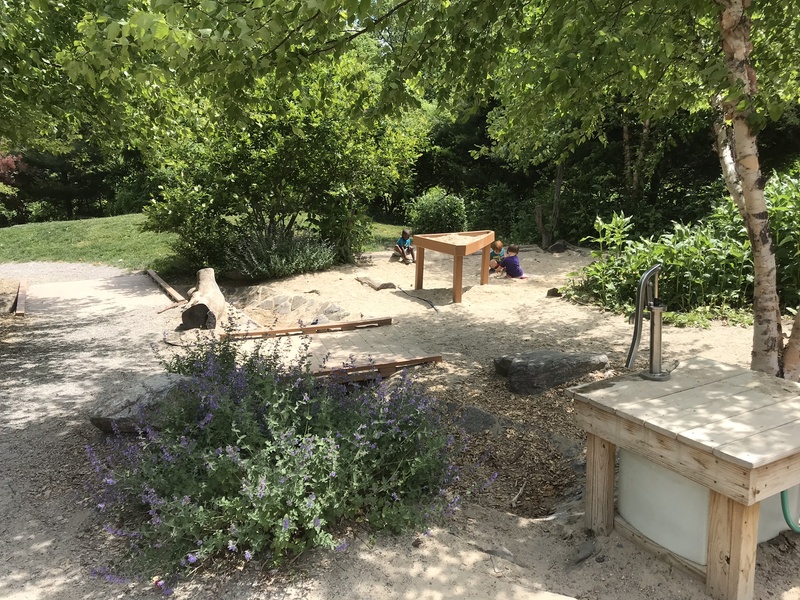 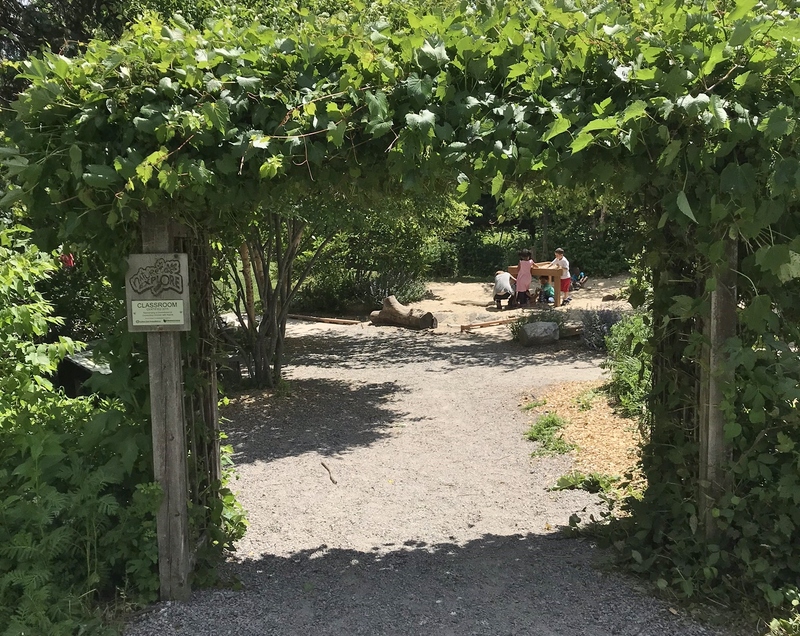 Plants, rocks, stepping stones, logs, water and sand play tables, musical chimes, and a vegetable garden were added to the space. 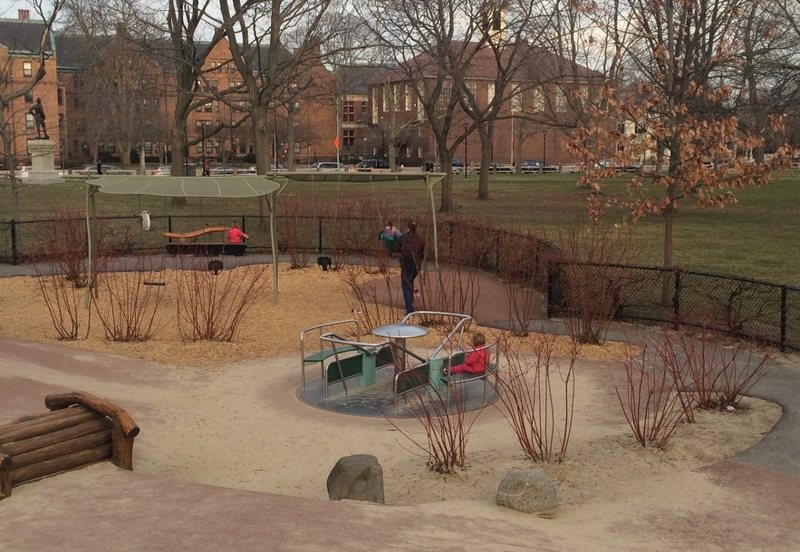 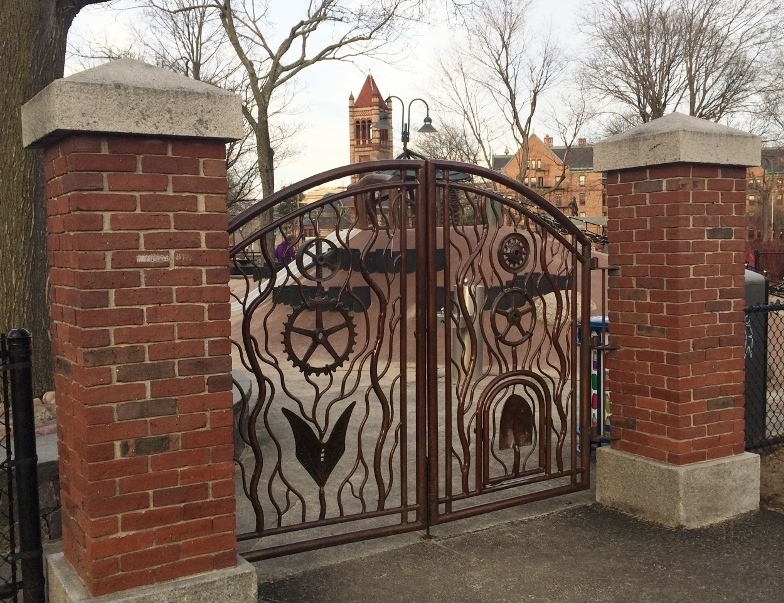 Although the playground is used exclusively by the day care center during the weekdays, it is open in the evenings and on weekends for use by neighborhood children. 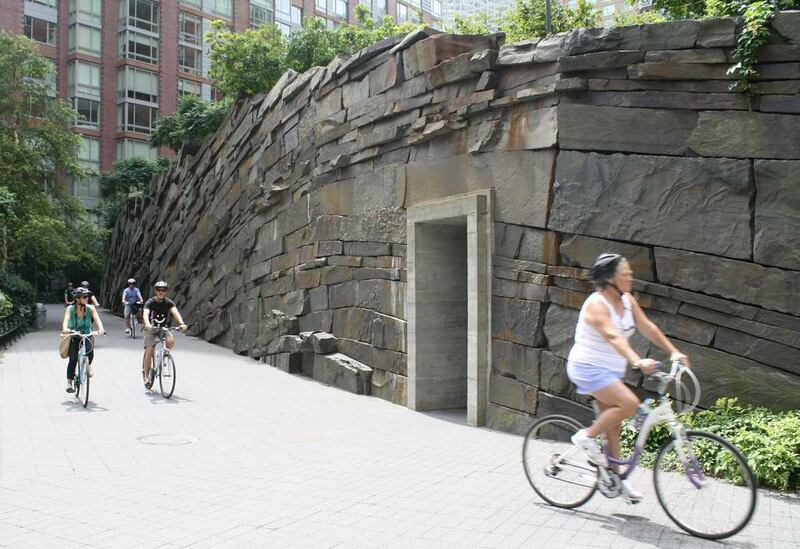 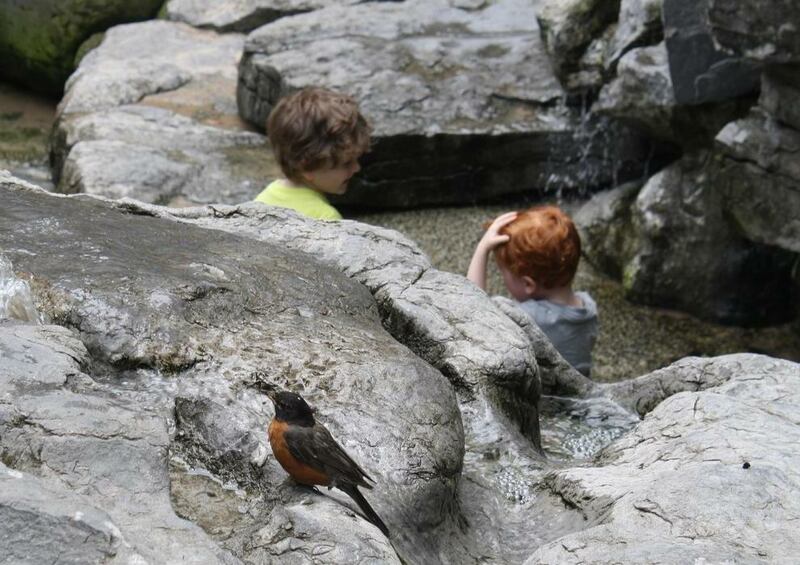 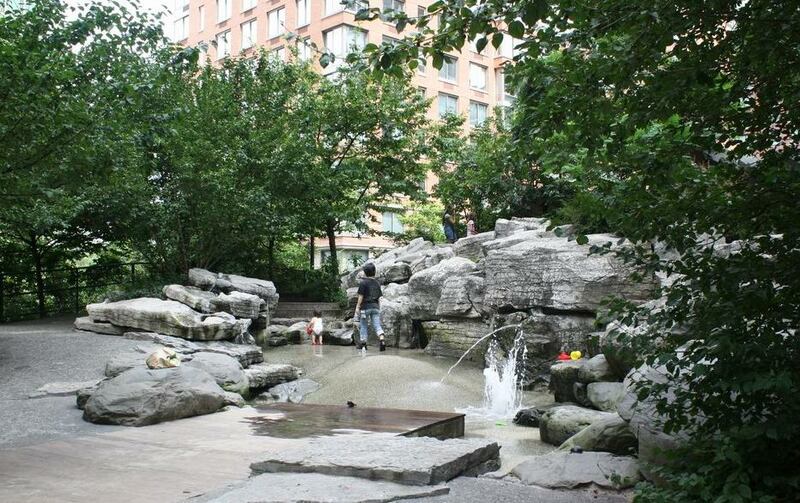 The kids get a lot of enjoyment out of this space, and I’m told that the natural features are particularly popular. 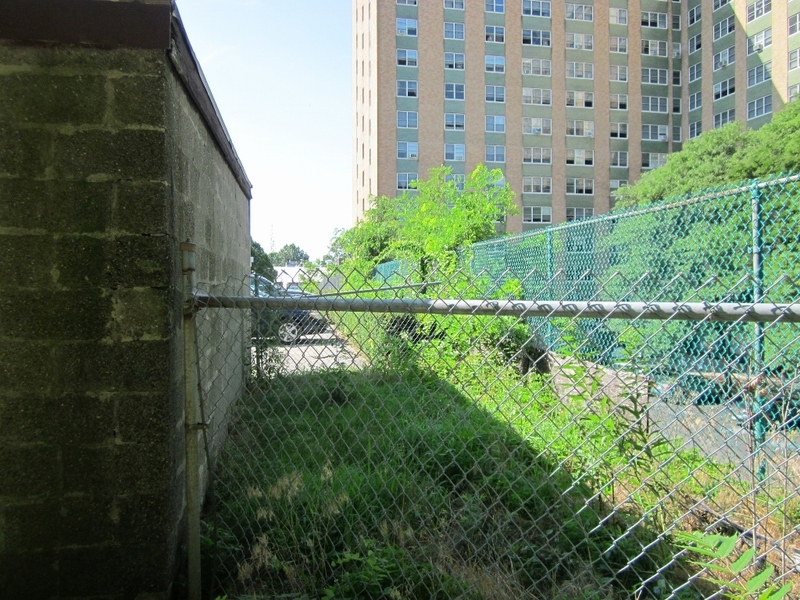 A few “before” and “after” photos are included below to illustrate the improvements. 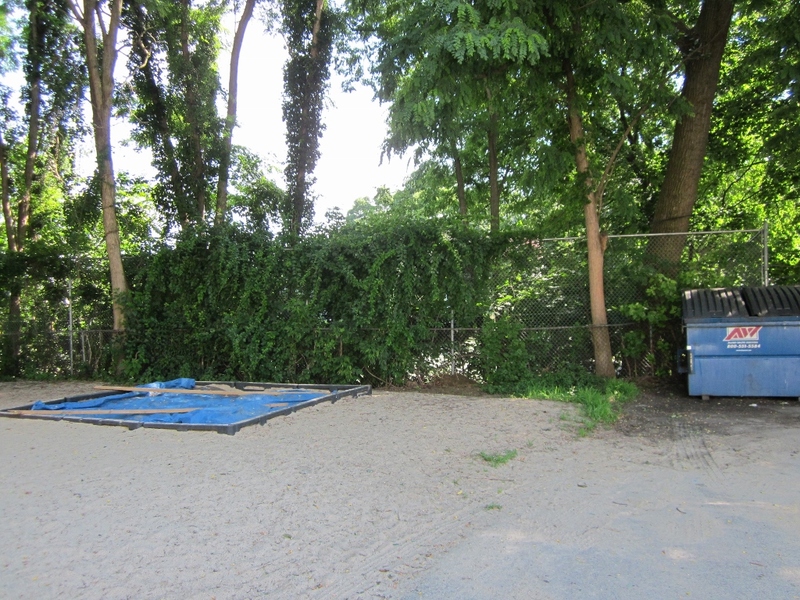 BEFORE: A couple of play panels, sand surfacing, weeds, and an ugly fence (owned by the neighbors) were all that existed on the west side of the playground. 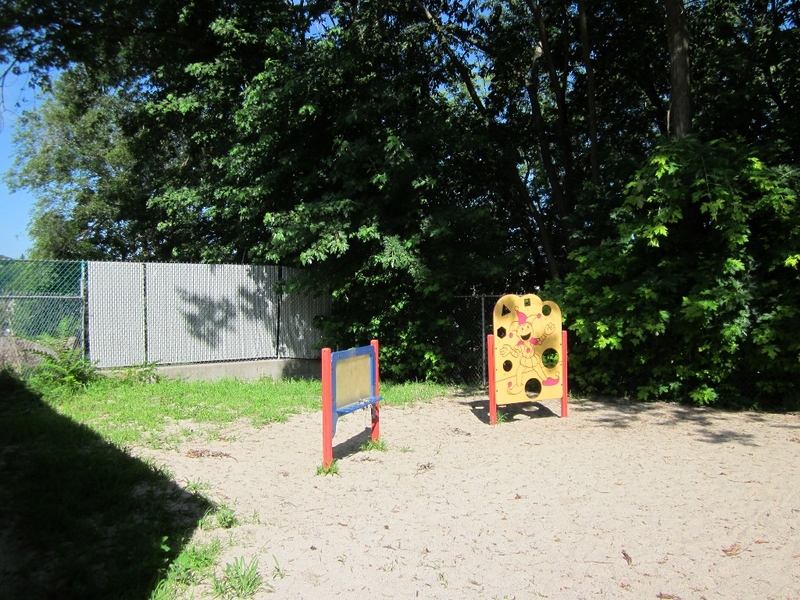 The wooded area behind the play area is on adjacent property. 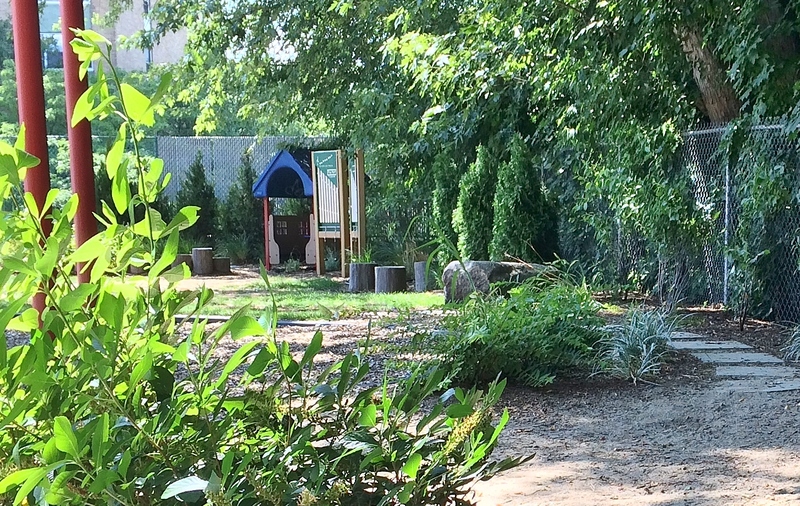 AFTER: Relocated play house, plants (including shrubs which will grow to hide the fence), stepping logs, & chimes. 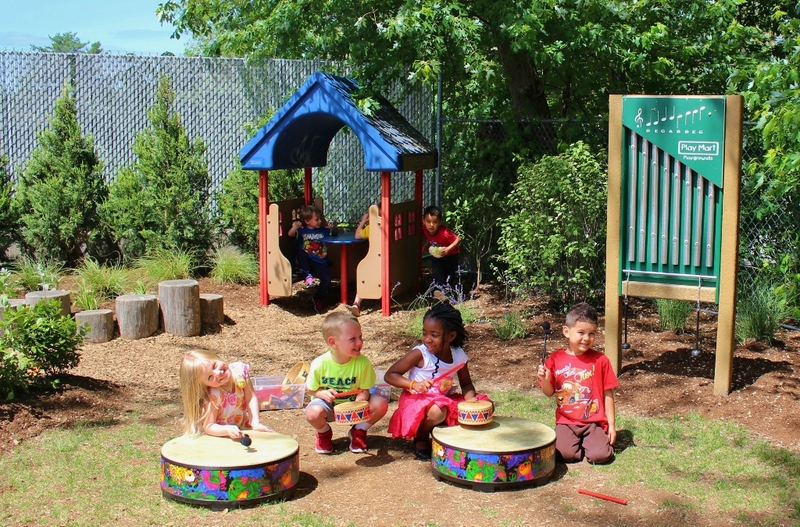 The drums are portable, stored in a nearby shed. 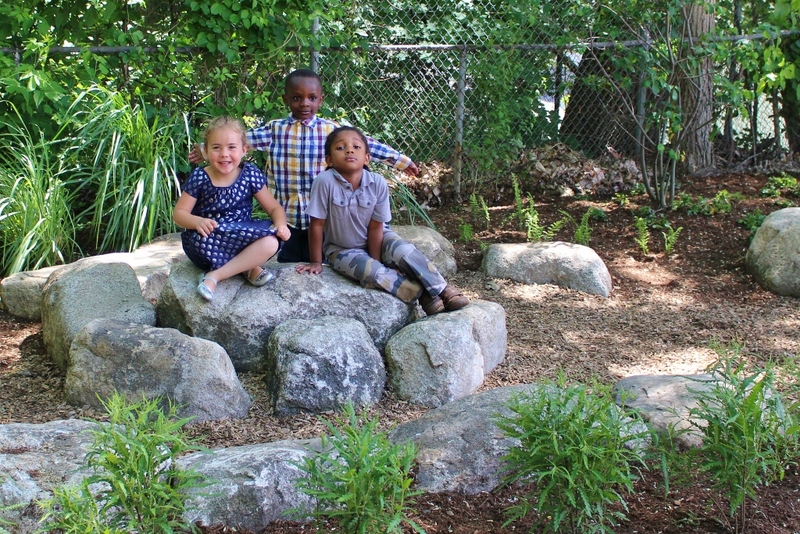 AFTER: Rocks and plants create a space for imaginative play. 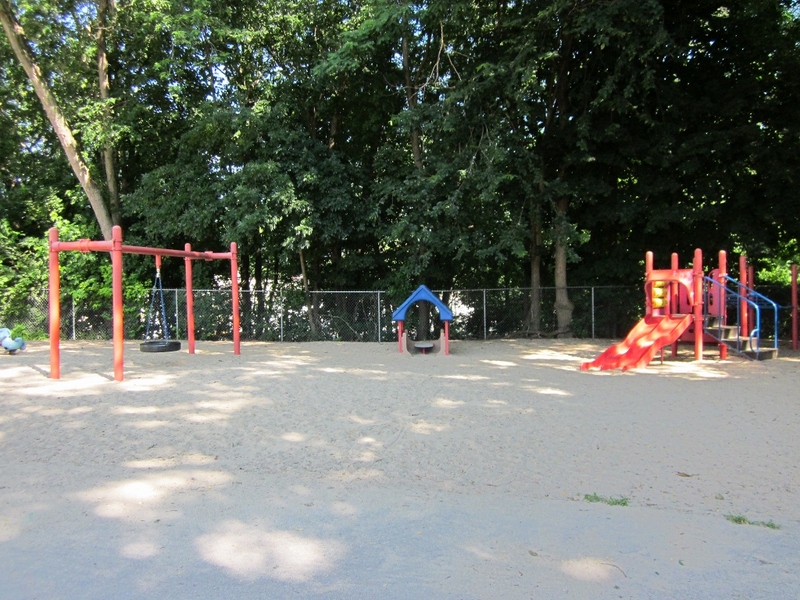 AFTER: Existing play equipment was retained, engineered wood fiber safety surfacing was installed, and a sand table was added. 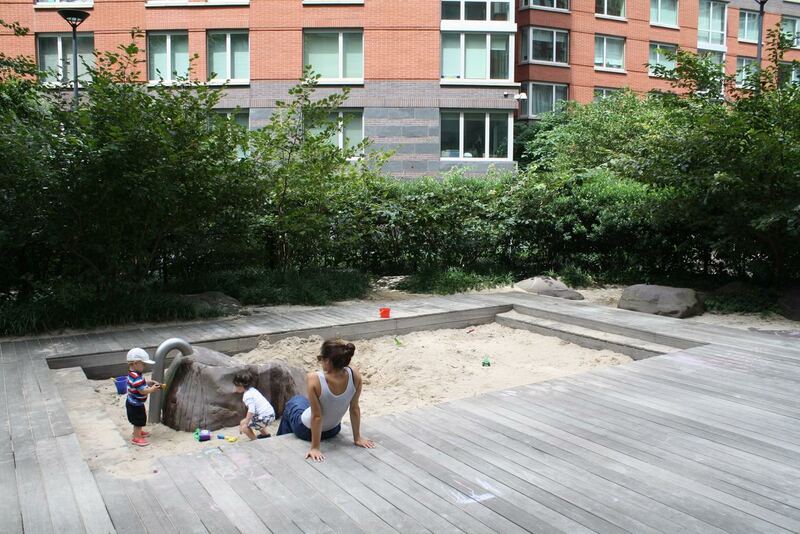 An at-grade sand play area is situated behind the table. 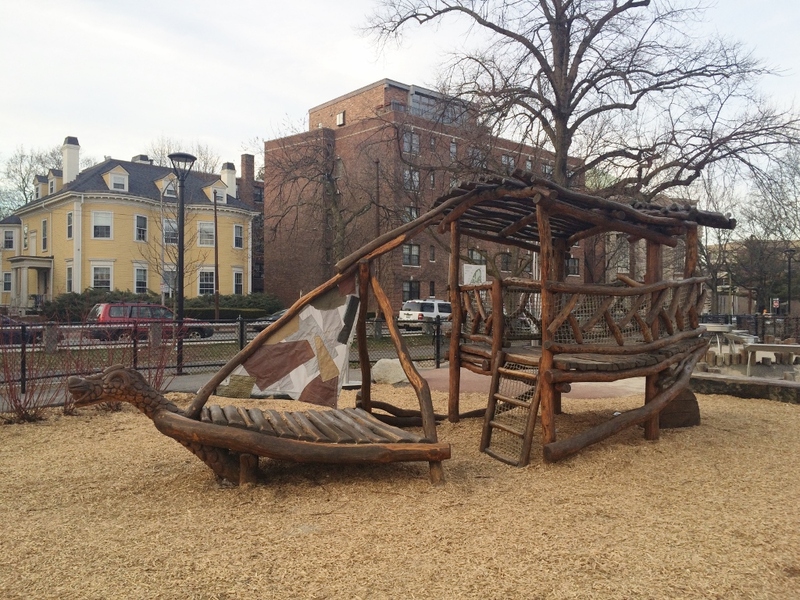 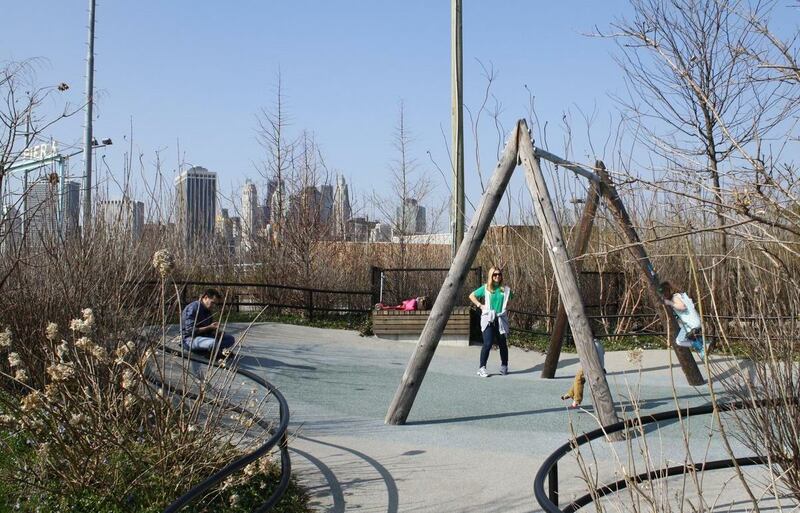 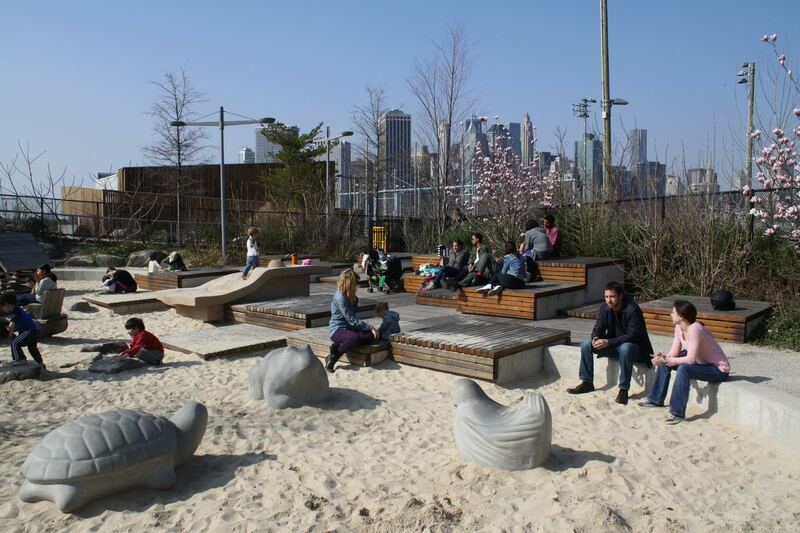 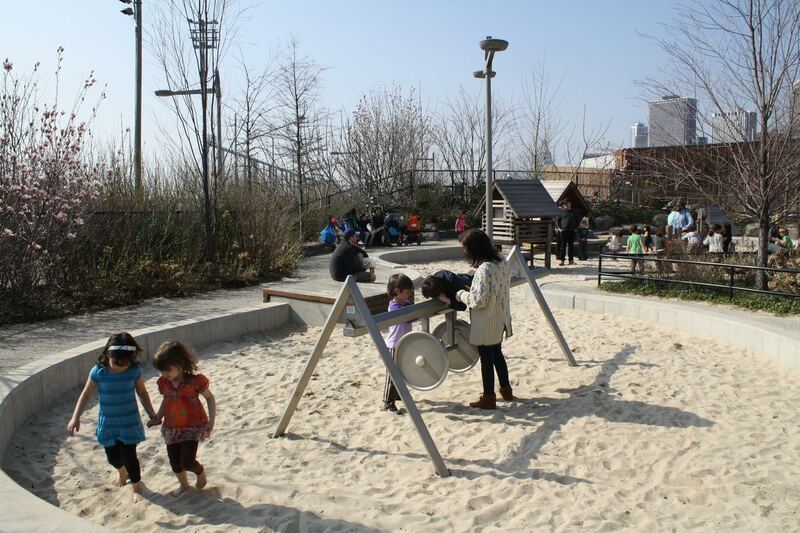 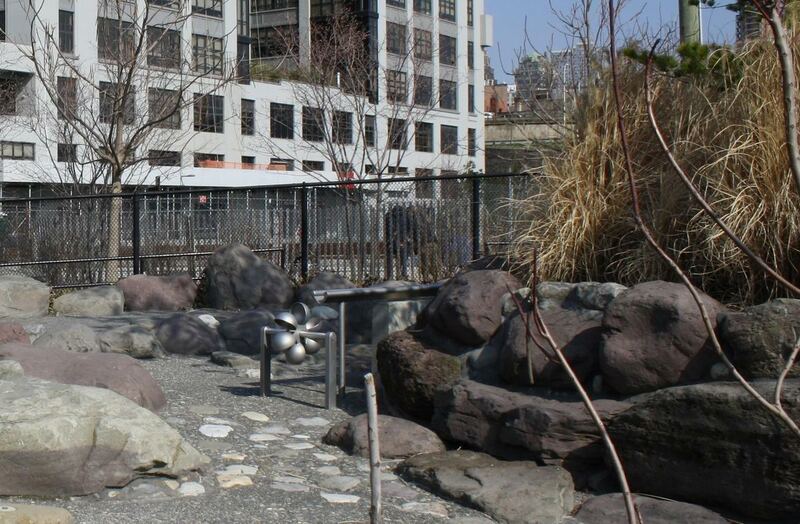 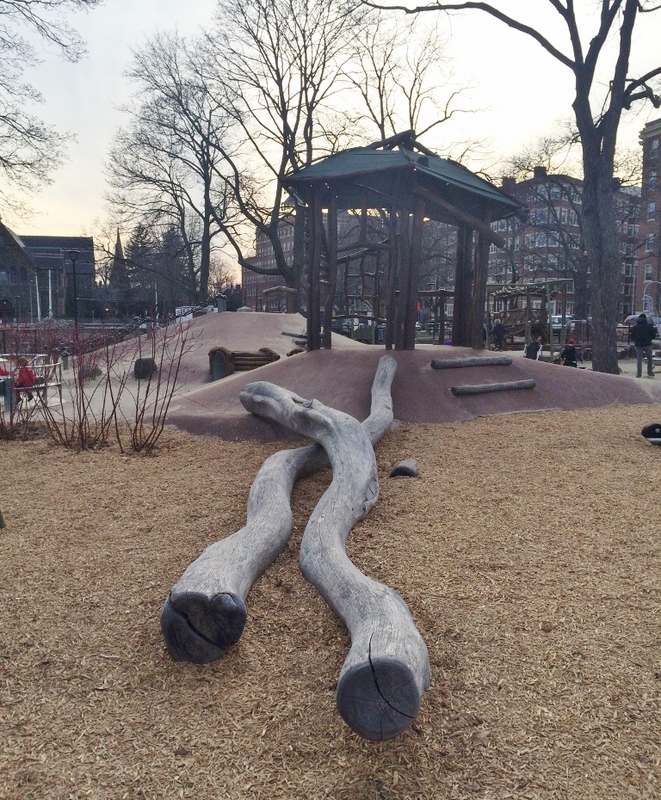 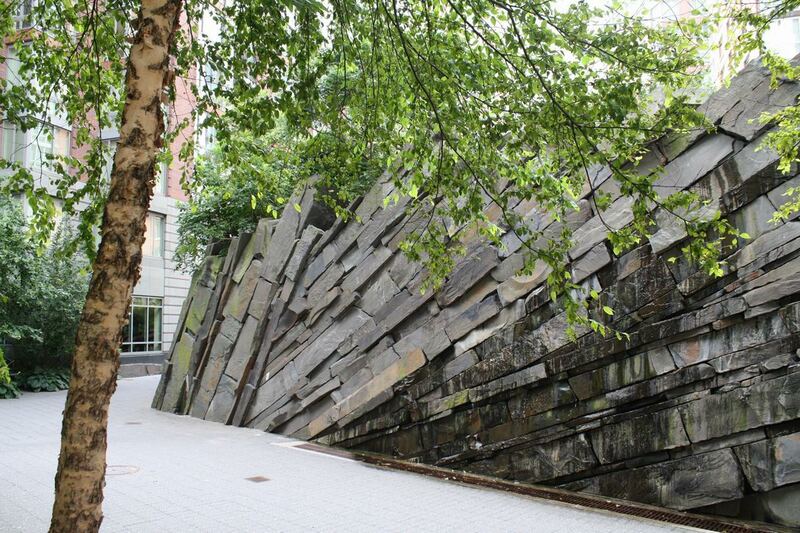 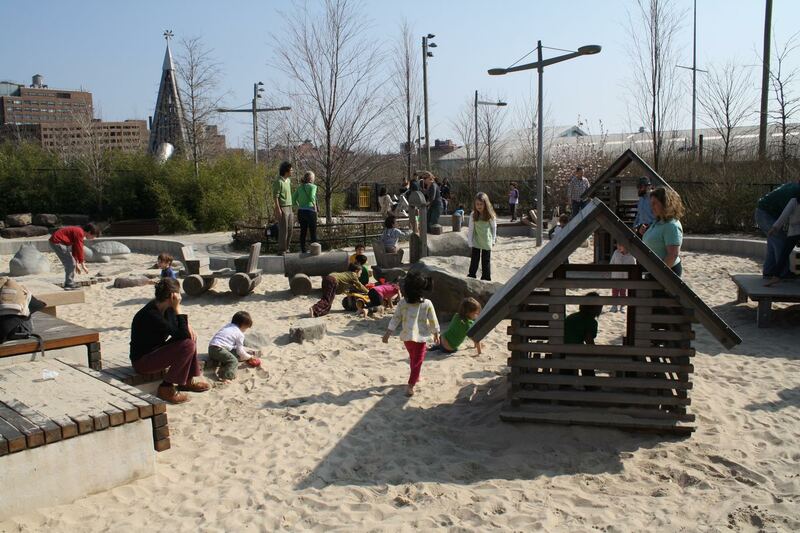 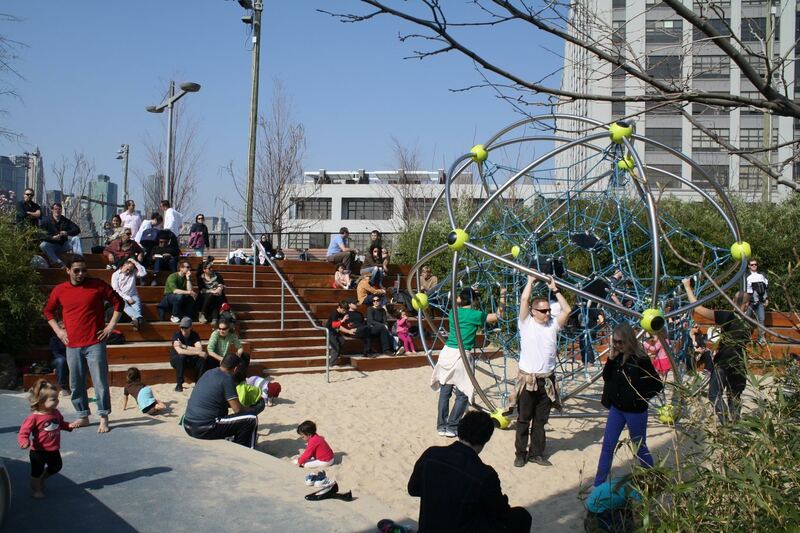 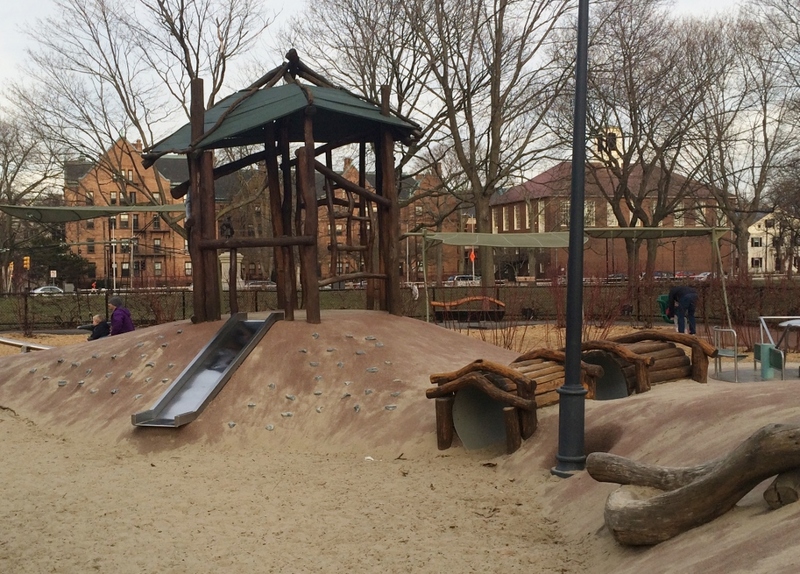 Early in the spring, I visited a creatively-designed playground at the Pier 6 section of Brooklyn Bridge Park in New York City. 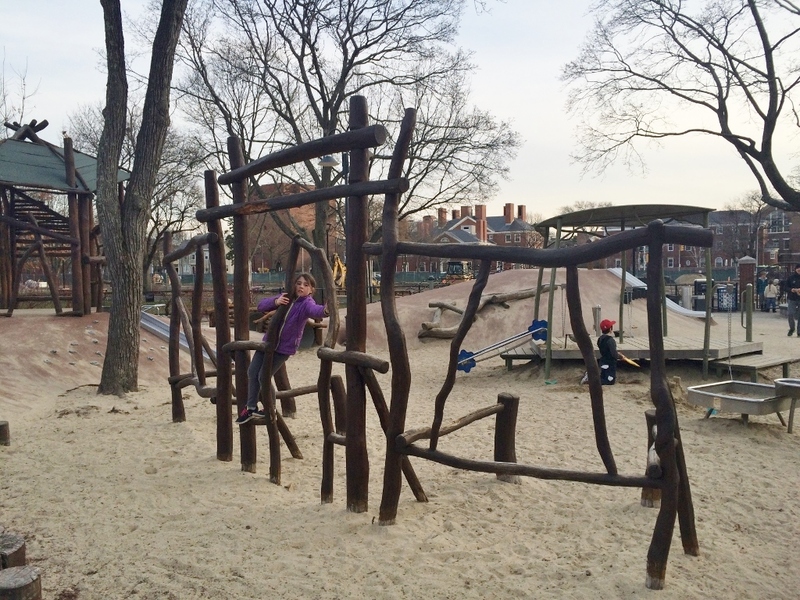 The day of my visit was unseasonably warm, so the playground was swarming with people. 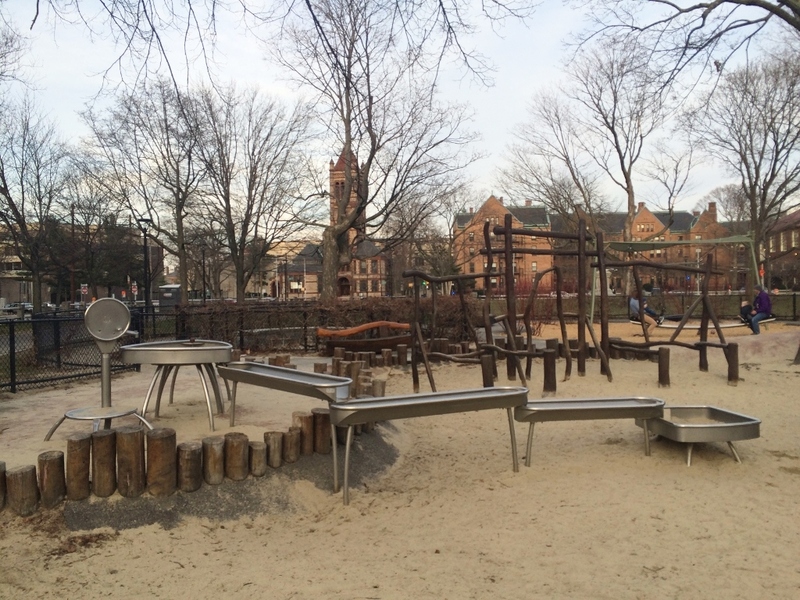 This play area is divided in several zones: an active area for school-age children with slides and climbers; a sand area for younger children with small climbing sculptures, play houses, and other elements; an area featuring numerous swing-sets situated between small hills; a water play area; and a natural vegetated area. 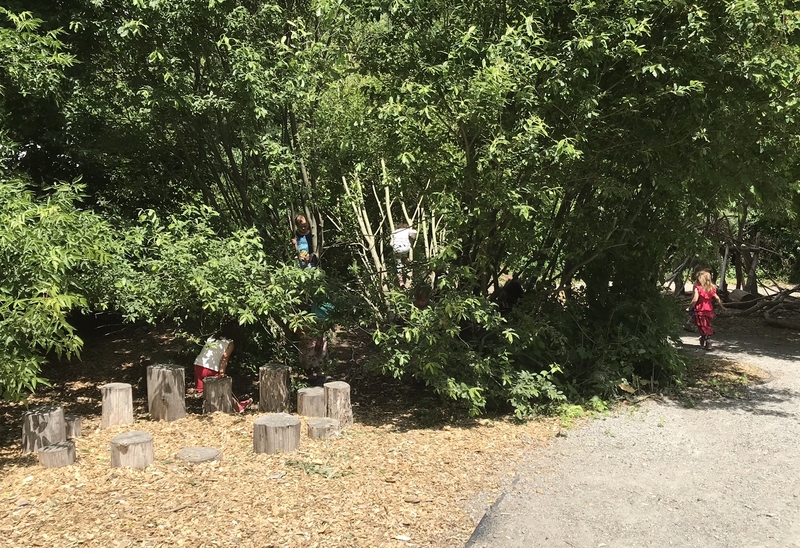 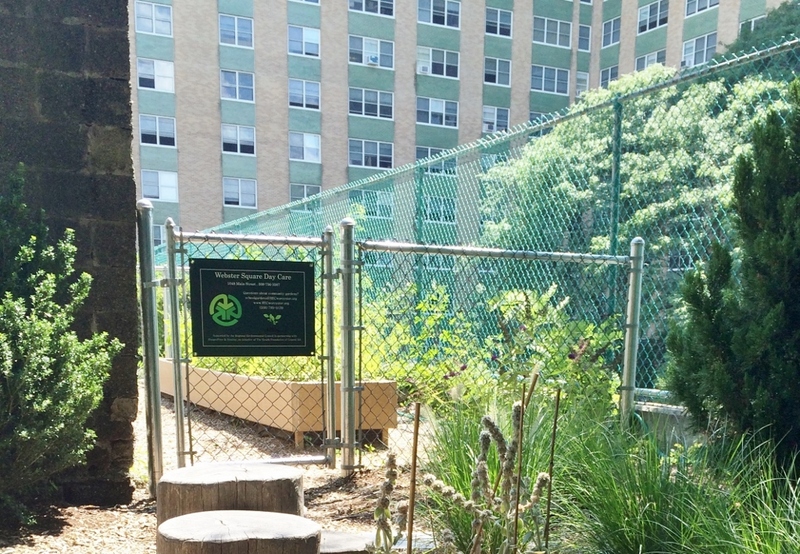 I was pleased to see that much of the playground includes lots of plants – great for play, shade, and beauty! 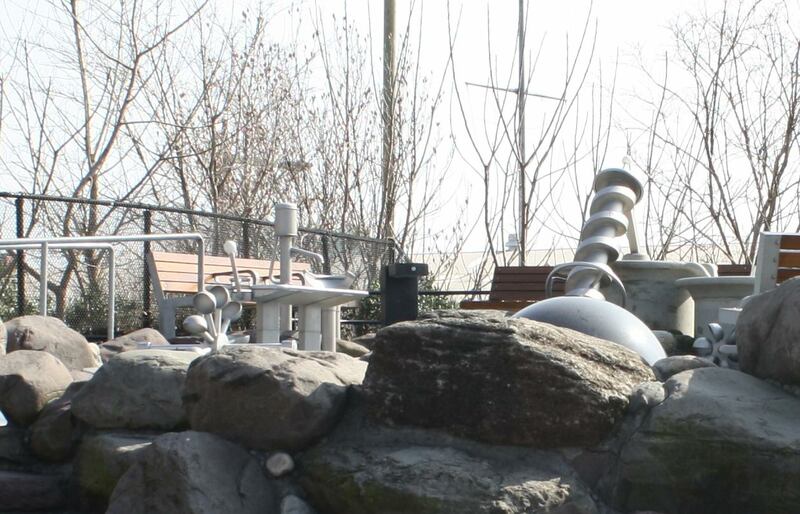 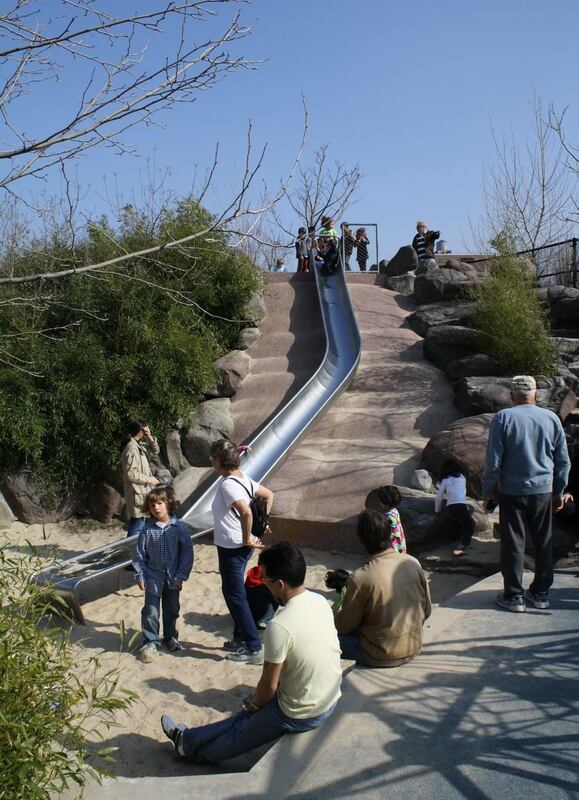 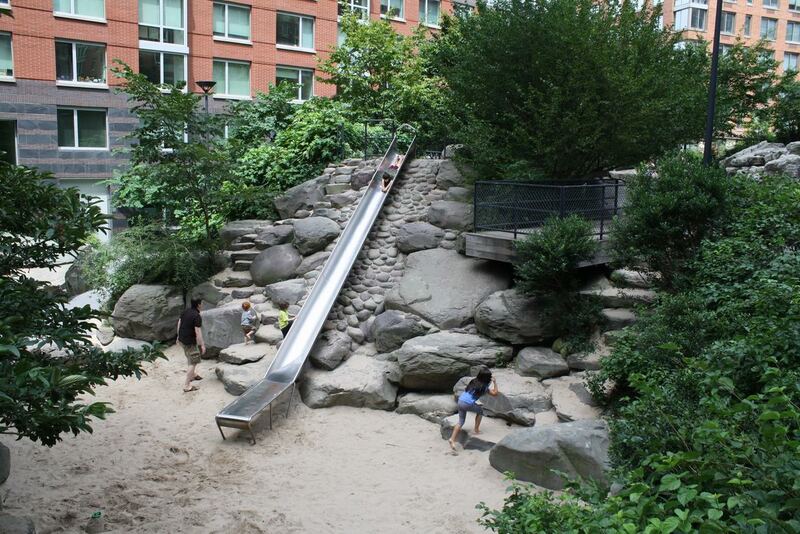 A play structure and stepped seating are included in the school-age children’s zone, which is called Slide Mountain. 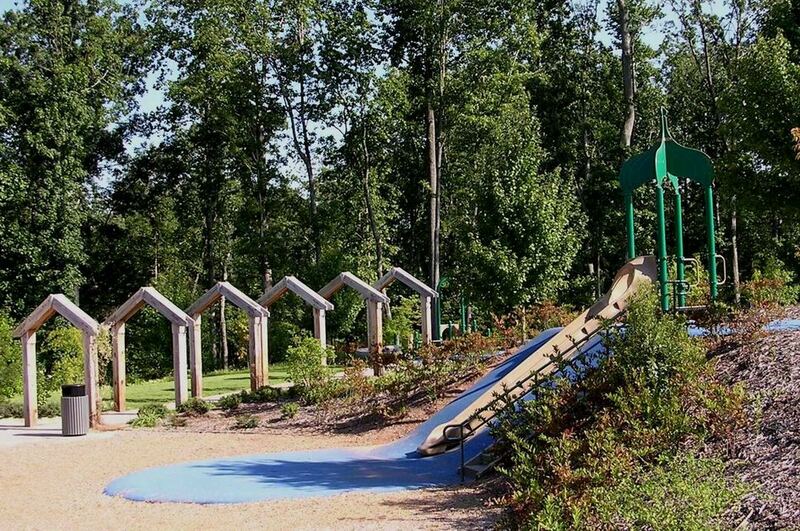 This is the longest of several slides located in Slide Mountain. 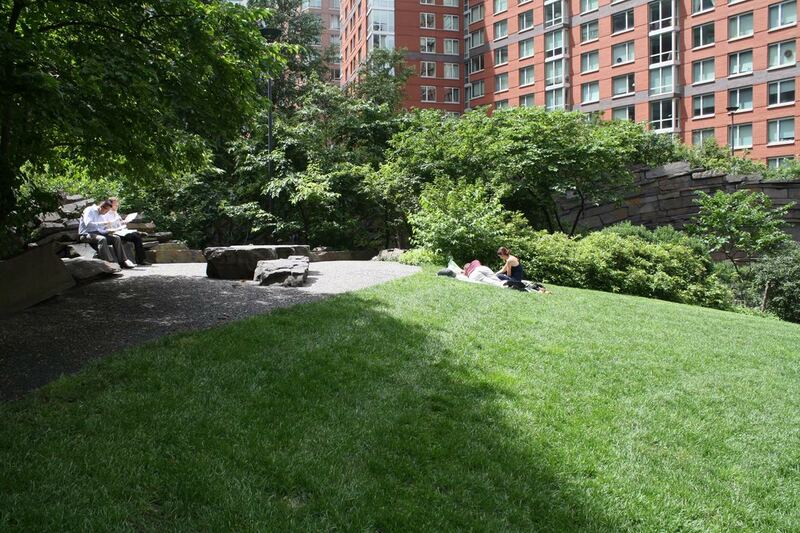 Swing Valley includes grassy hills along the walkways. 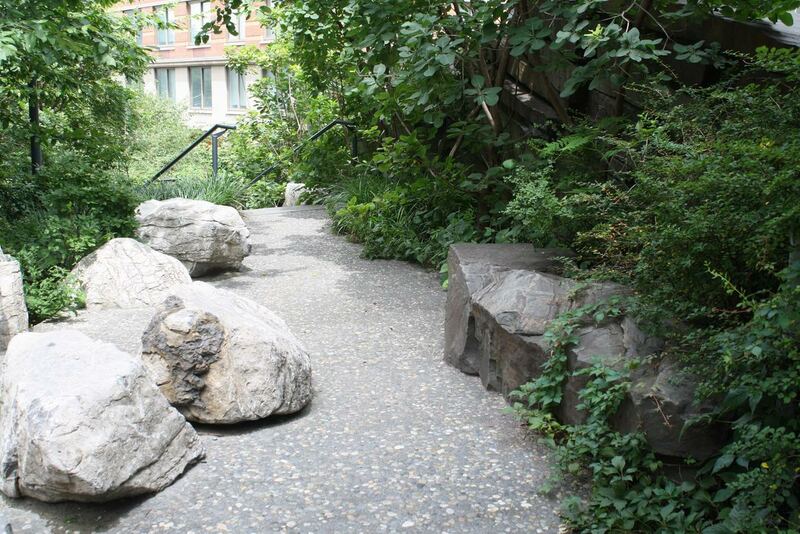 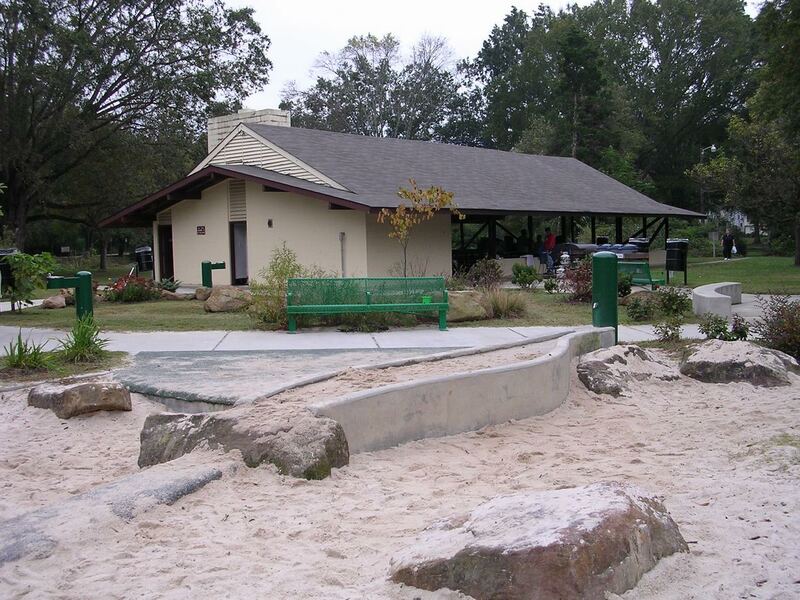 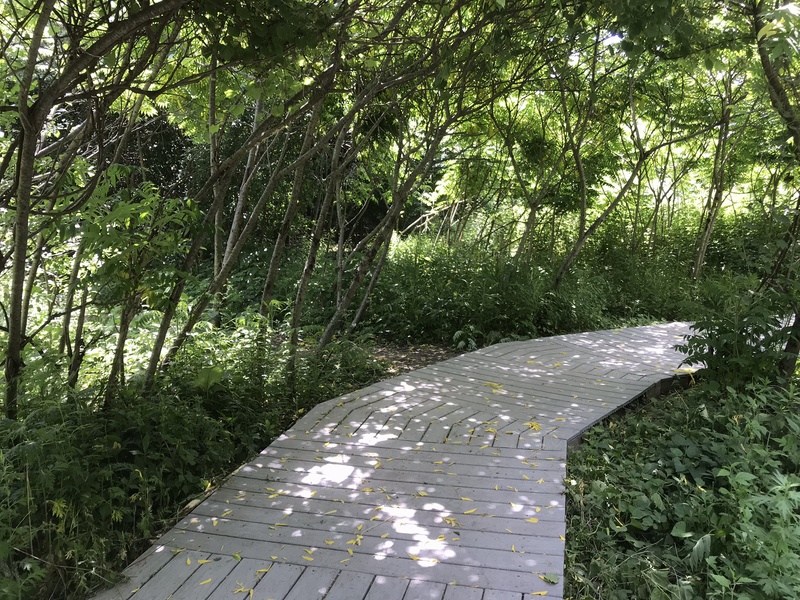 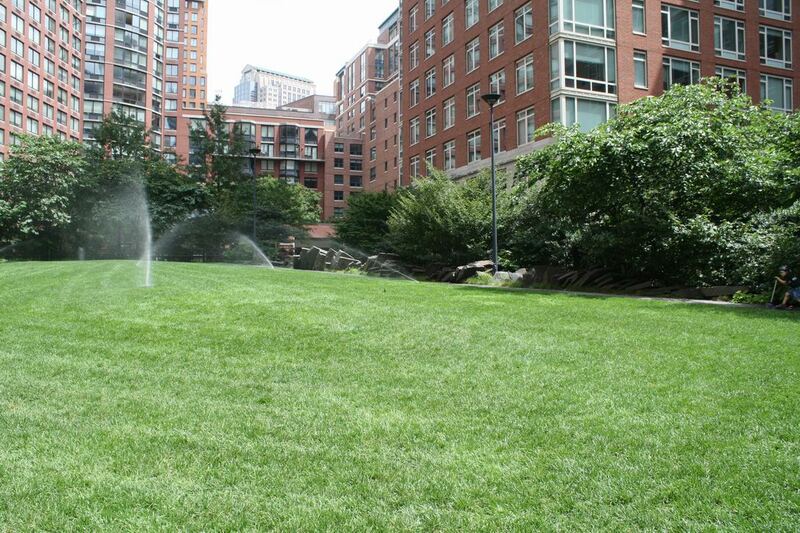 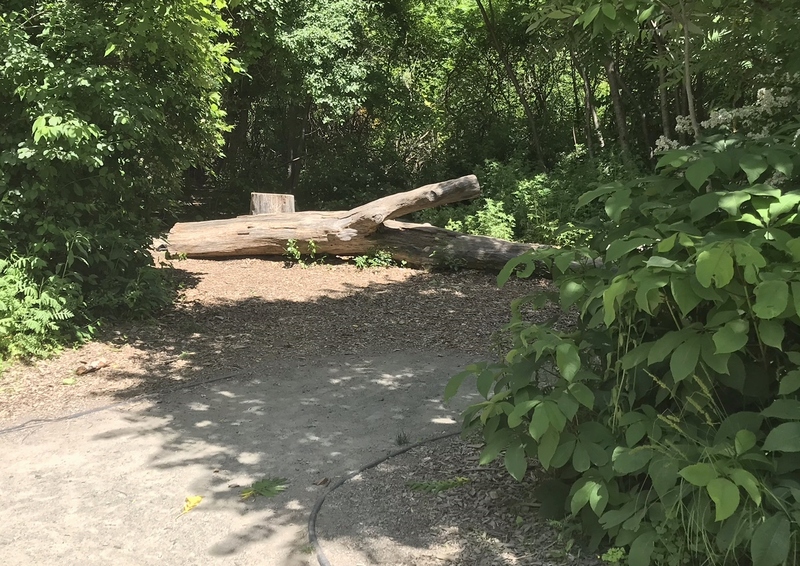 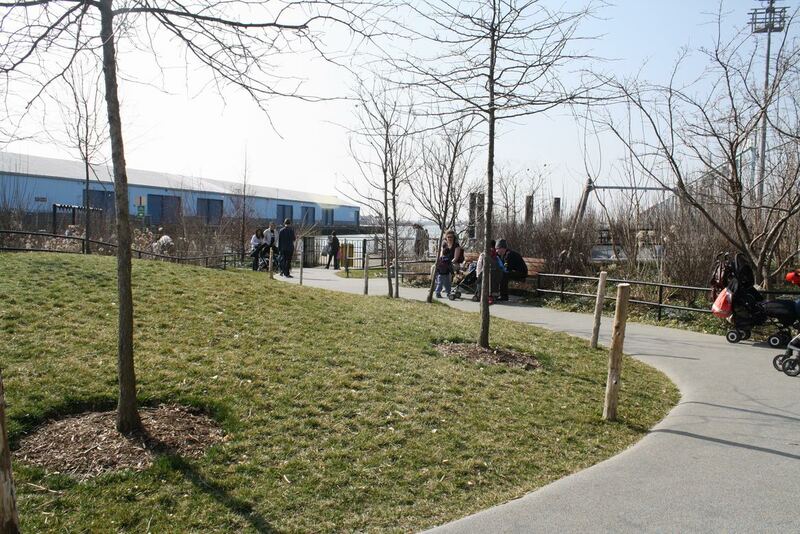 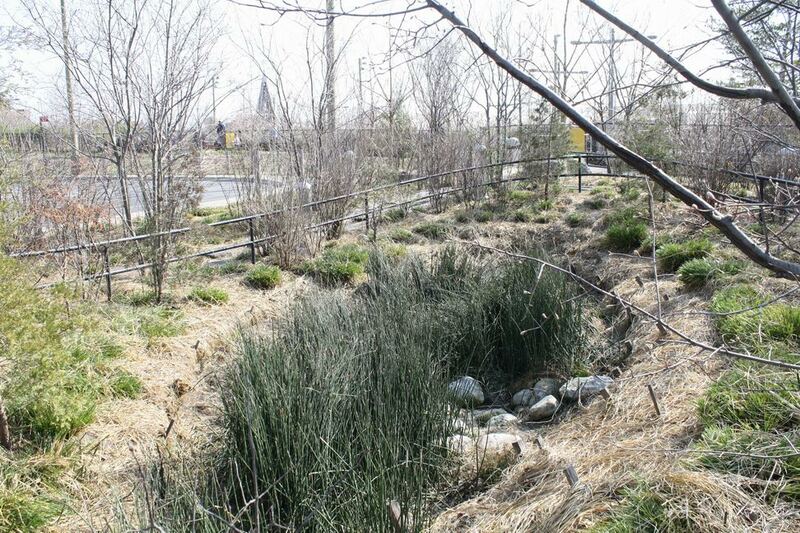 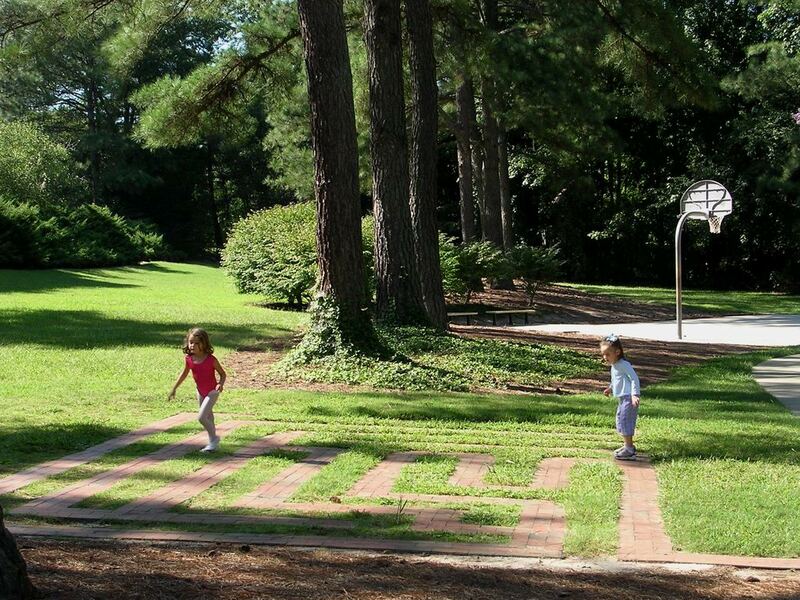 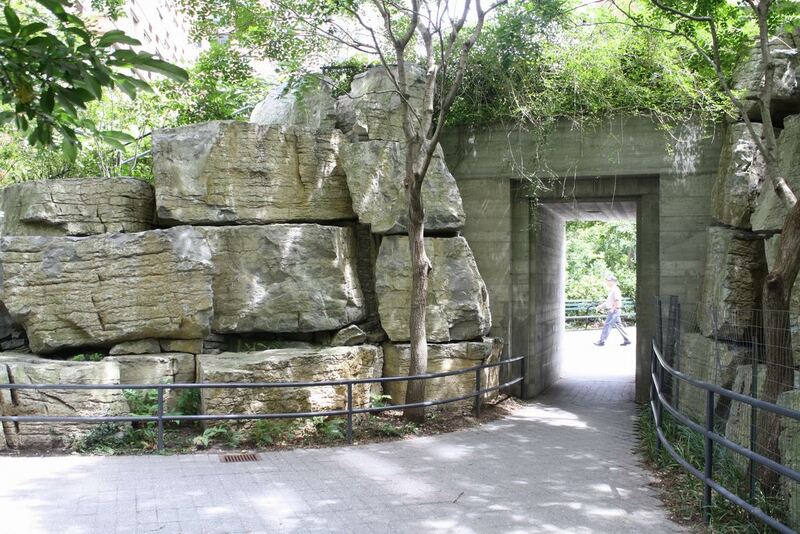 This natural area, which includes several paths and seating areas, is rather isolated from the other play zones. 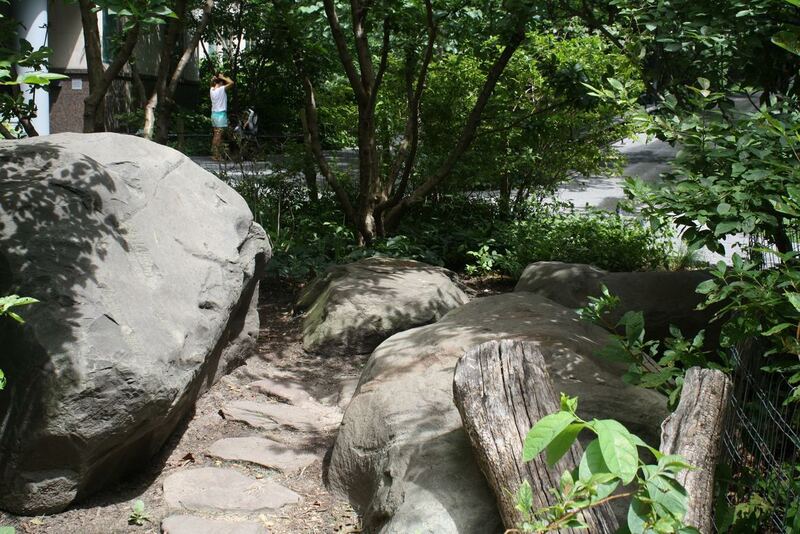 Very few people were visiting it when I was there. 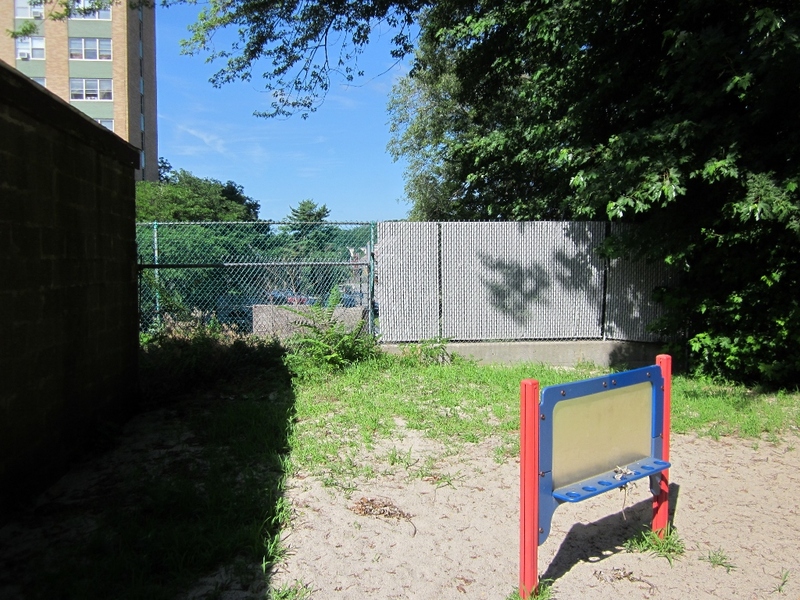 Fencing off the vegetated areas from access makes it less inviting to children also. 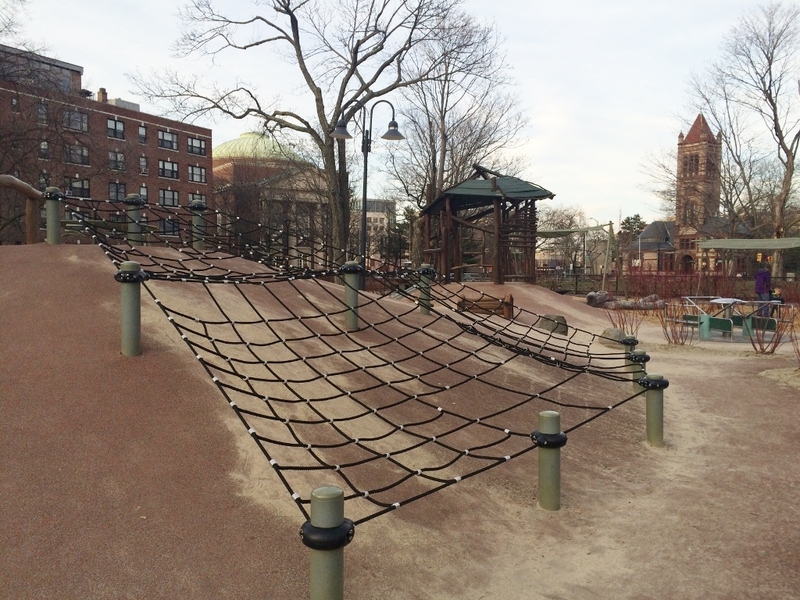 A children’s playground doesn’t have to be a boring flat area of safety surfacing with a couple of climbing structures plopped the middle. 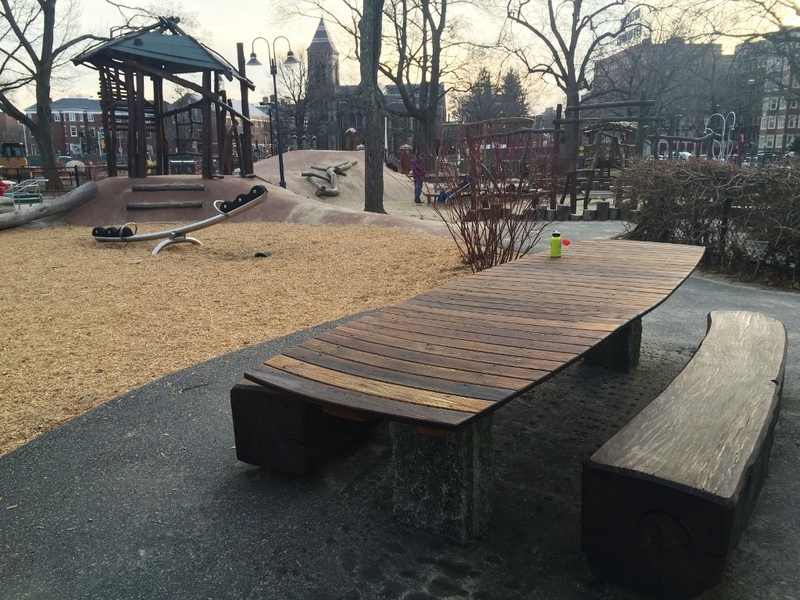 Interesting elements can be included that don’t add a lot to the cost of the project. 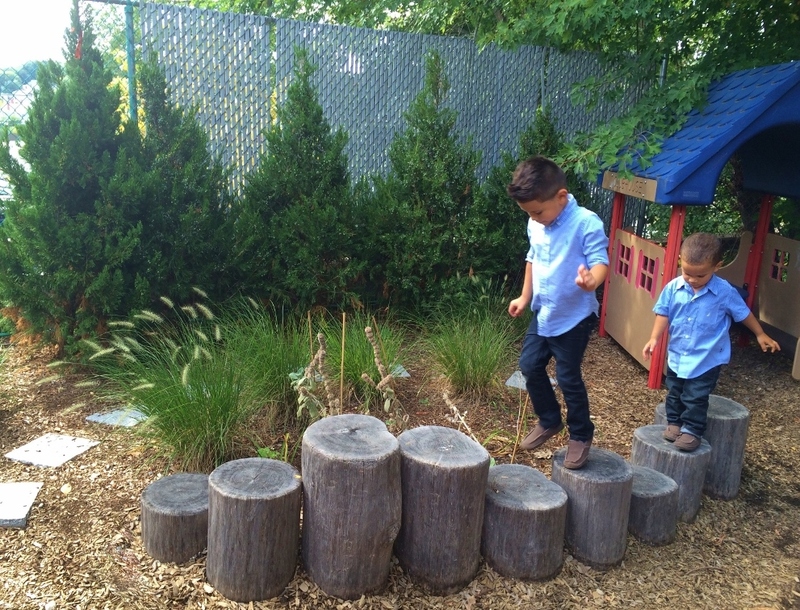 Below are examples of a few fun features that enhance play environments by providing more of a variety of activities, fostering creative play, and adding visual appeal.